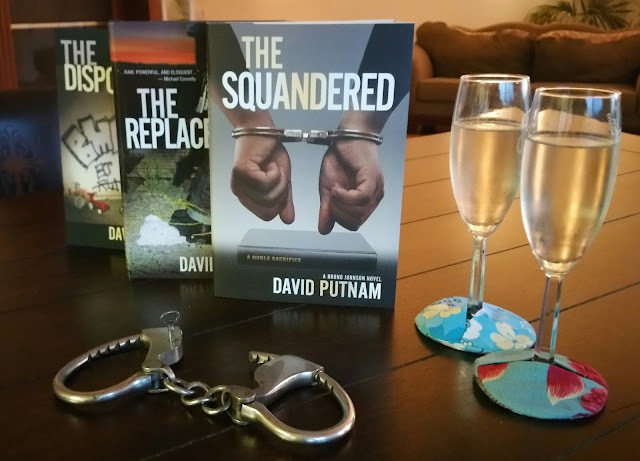 Author David Putnam, and his wife, Mary, are here on Drinks with Reads to explain why you should drink champagne with David's latest book, The Squandered. Keeping it simple for the latest Bruno Johnson thriller, The Squandered, which goes well with some bubbly... sparkling wine... champagne... chilled. If you're not a purist, and like a little sweet w/your alcohol (or books), add a squirt of your favorite water or coffee flavoring. For water flavors, I like citrus or tropical flavors -- mimosa with fewer calories! For coffee flavors, I like vanilla, almond, or caramel. Here's why, without spoiling anything: you'll notice at the end of the first paragraph in the acknowledgments: big thanks to Dave's sister Sheri for: "...ideas for the progression of Bruno and Marie's love story." Mary especially likes the love story part -- which involves champagne -- and that it was Sheri's idea, since the book is a lot about family bonds. Speaking of bonds… note that the handcuffs pictured here in the foreground are NOT the same as those pictured on the cover. These antique cuffs date from the late 1800 and were a gift to Dave from his dear friend and brother-from-another-mother, Bill. Speaking of the cover… you might notice a different look-and-feel this time. The first two Bruno Johnson thrillers involved cover photos shot at our house (that's why we had the gun and the pink pig from The Replacements, and how Mary's graffiti-handwriting ended up on the cover of The Disposables -- now available in softcover & audio, BTW). It took a couple of tries to get The Squandered right. In fact, Dave's first draft of that third book was all but rejected by his publisher -- they wanted major changes that he felt would unravel his whole plot, so he sat down and wrote a second version in just three months. They told him how much they "loved the re-write" (all he kept from the first attempt: the title, and the characters, of course). So when they accepted the new Squandered, we had extra, extra champagne! 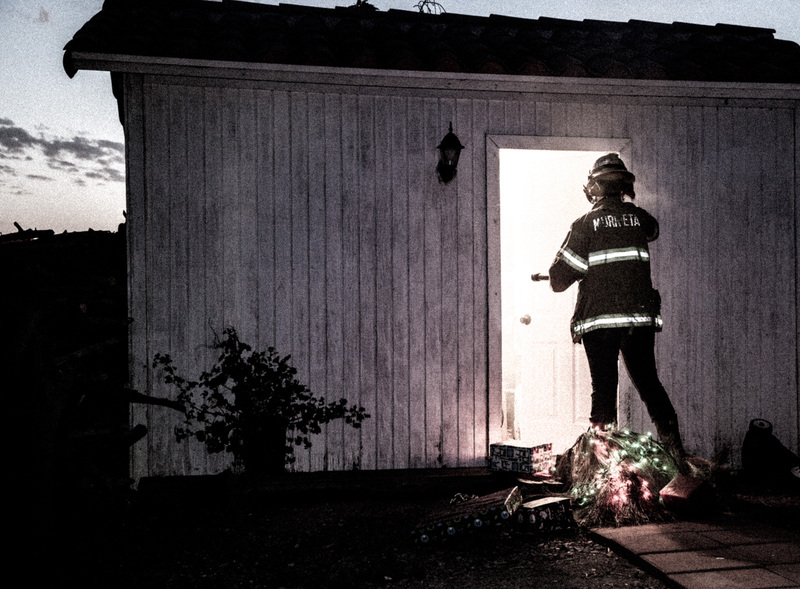 Meanwhile, for the cover, our original attempt at a photo involved a house fire (from one of the key scenes in The Squandered, based on true events that Dave experienced as a young cop). The firefighter's jacket we borrowed came from a female firefighter with narrow shoulders, so Mary ended up as the "model" in that photo shoot. Yes, that's love, she'd walk into a burning building or let us light her on fire for the sake of a cover. Although these didn't make the cut for the book cover, Dave sent them to some friends with the caption: "check out my hot wife!" I am not familiar with this author and/or series, but WOW. I have to read this books now. I love the way he speaks about his wife and yes, going into a burning building is LOVE. Thanks! THE SQUANDERED eBook is on sale for a few more days for 99cents, and THE DISPOSABLES & THE REPLACESMENTS eBooks are also at a discounted price for a limited time.